36" x 40" x 12"
Sculptor Dean Snyder once commented that of the myriad of qualities an object could have, some suggestion that the object was both mobile and pathetic would most likely strike a human cord. That view is both funny and cynical, but also true that something animate and helpless would gain empathy. Humans respond to things that move, and to things that try against the odds. When compared to manufactured objects of straight lined metal and injection molded plastic, humans are usually more mobile and pathetic, but often in a quirky and lovable way. The myth of Sisyphus pushing a boulder up a hill day after day in Hades is a perfect example of making a hopeful but futile effort in spite of the evidence. 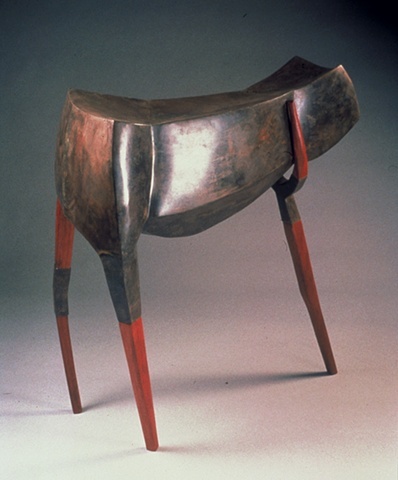 The hall table "Onward" has two hind legs and a third "leg" crutch, which seems to choke it more than to propel it forward. Nonetheless, the table keeps its head held high in hope and determination. The body is fabricated steel. 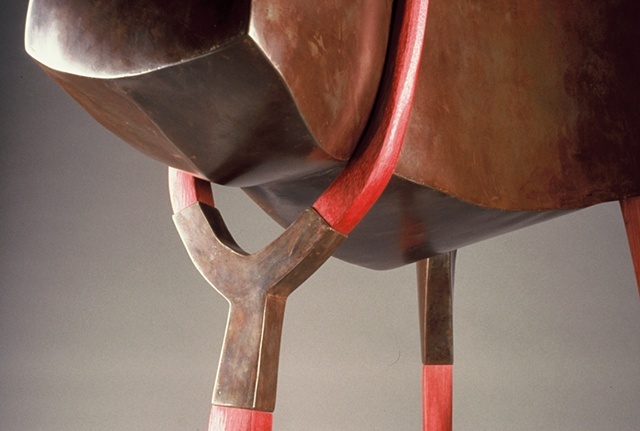 The wood yoke and legs connect to the metal in mortise and tennon joints.